A famous soccer coach has been murdered and his priceless ring stolen – a ring set with the stunning diamond known as the Pink Panther. Cracking the case becomes a national obsession, and Chief Inspector Dreyfus (Kline), up for the prestigious Medal of Honor…again…for the seventh time...can't afford any mistakes – at least none that can be attributed to him. Enter indefatigable Inspector Jacques Clouseau (Martin), a name that strikes fear into...well, everyone. His deductive powers are limited, his command of the language frightening, his reflexes hazardous. His approach may be alarmingly unorthodox, but he always solves the crime – in his own fashion – with hilarious results. Get ready to be tickled pink! 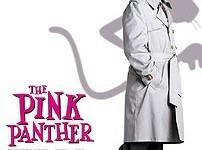 Comic superstar Steve Martin stars as Clouseau in an all-new adventure of "The Pink Panther".